DALLAS and CAESAREA, Israel, May 22, 2017 /PRNewswire/ -- Zion Oil & Gas, Inc. (NASDAQ:ZN) announces its new Unit Option program under its Dividend Reinvestment and Common Stock Purchase Plan (DSPP). "In anticipation of finally spudding our long-awaited Megiddo-Jezreel #1 well, we are launching our new $250 Unit Option that enables potential investors to quickly and easily play a part in Zion's mission for Israel's energy independence," says Victor G. Carrillo, Zion's CEO. b) 25 common stock purchase warrants. Each warrant (symbol "ZNWAF") affords participants the opportunity to purchase one share of ZN common stock at a warrant exercise price of $1.00. The warrants will first become exercisable on August 14, 2017, the 31st day following the Unit Option termination date (unless extended), and continue to be exercisable through August 14, 2020 (three years) at a per share exercise price of $1.00. All references in the Original Prospectus Supplement, concerning the Unit Option, continue, except for the substitution of the new Unit Option terms and features above. All other Plan features, conditions and terms remain unchanged. 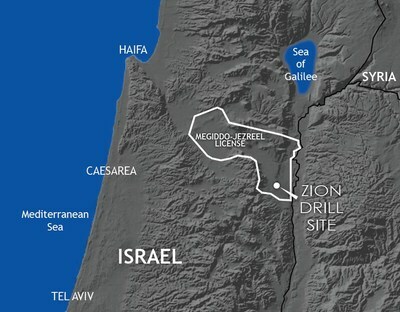 Zion is dedicated to exploring for oil and gas onshore Israel and is 100% focused on its Megiddo-Jezreel License, a large area south and west of the Sea of Galilee that includes the Jezreel and Megiddo valleys. This license gives Zion the exclusive right to explore in an area of approximately 99,000 acres that appears to possess the key geologic ingredients of an active petroleum system with significant exploration potential. Zion Oil & Gas, Inc. has filed with the SEC a registration statement (including a prospectus) for the unit program under the DSPP to which this communication relates. That prospectus and other documents the Company has filed with the SEC may be obtained at no charge (free) by visiting EDGAR on the SEC website at www.sec.gov. Alternatively, the Company will send you the prospectus upon request by calling toll free 888-891-9466. Direct links to the SEC location, or to the documents in PDF, may be found on Zion's home page at www.zionoil.com.